I’ve been a carnivore, and an enthusiastic one at that, since before I knew how to tie my shoes. To be fair, I didn’t learn the proper way to tie shoes until I was in middle school; until then I used an awkwardly contrived method of shoelace entanglement that would eventually resemble a bow after a decent bit of fussing with. At any rate, meat has been the savory object of my desires for quite some time. I ate my first whole rack of ribs on my sixth birthday, and I’ve never had a birthday as revelatory as that one. 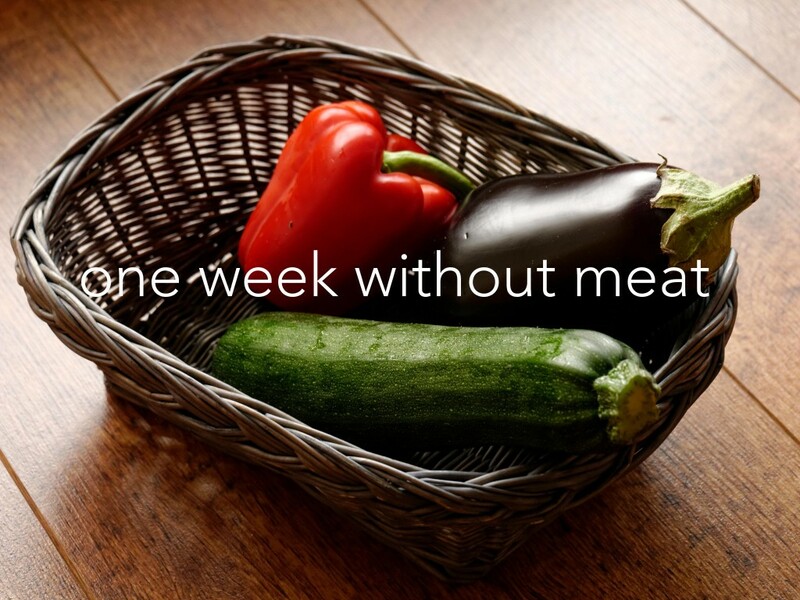 Why Go One Week Without Meat? I always think of the sketch on Chappelle’s Show where they offer ribs as a prescription sleep aid, but it’s true. If I have a burger or barbecue for lunch, I’m guaranteed to spend the next hour at least staring cross-eyed at my computer screen without actually doing anything. On the contrary, when I have a black bean burger or vegetarian chili for lunch I feel full, but my stomach doesn’t feel heavy and I can get on with my day actually feeling like a normal, healthy adult. Look, I don’t want to inflame any fellow meat lovers, nor can I claim myself as anything resembling an authority on the matter, but I’ve seen plenty of studies claiming the ill-effects of red meats and praising the restorative value of fruits and vegetables. On Tuesday, The Guardian posted a study showing that those who consume animal protein as a significant portion of their diet may be 4 times more likely to die of cancer than those who do not. Regardless of where you stand on this, it’s a bit disconcerting. I’ve been tracking my grocery bills for the past three weeks and found that meat makes up about half of the total money I spend (much of the other half is coffee). On the other hand, fresh produce and canned vegetables cost next to nothing and can be put to even more delicious uses in the hands of a decent cook. I don’t think that meat is the root of all evil (at least not the way that Morrissey does), but I can say for sure that I don’t eat enough vegetables. I think that part of this is because I just don’t know what to do with them. Well, I’m going to learn. So, I’m going to give up all meat—beef, chicken, pork, fish, etc.—for one week starting now, though I will continue to eat eggs and some dairy. In the meantime, I’m going to learn, share, and maybe even improve upon some tasty vegetarian recipes, and will report back on how the meatless life affects my mood, wallet, health, weight, and anything else that comes up in the process. As always, I’ll post a midweek update and a wrapup here on OWW, and will cover the day-to-day on twitter (@scottmarquart) with the tag #owwMeat. This is one of those challenges I know I should do for myself. I eat way too much meat and carbs and not nearly enough produce. I’m very curious to see how a fellow carnivore handles such a week! Very inspirational! I look forward to the update and to try your recipes! Sorry, but I doubt that only one week will change anything, it’s way too short. Maybe try one month? I’ll get there! Taking it one week at a time as always, when this one is over I’ll evaluate and see if I should extend it, if I should try and only eat meat in moderation, or if I should quit it altogether. You can definitely see your skills in the paintings you write. The world hopes for more passionate writers such as you who are not afraid to mention how they believe. Always go after your heart.